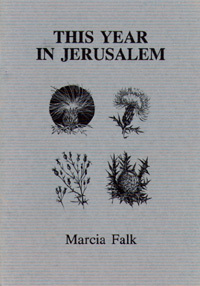 "Marcia Falk's lyrical poetry evokes brilliant images of Jerusalem . . . The poems are visions filled with light, color, each a canvas of its own . . . Her pictures are fresh, with a tinge of irony . . . Underlying the beauty is always the sense of reality. Peaceful images with an awareness of war, Jews and Arabs in the same world . . . Falk . . . is surely one of America's finest poets, whose deep Jewish roots permeate her poetry." as red as freshly scraped knees. while forces spread in the North. than what the cold eye sees? sheep, alive in a field. She was once a noblewoman in Jerusalem. One day she vanished, leaving behind all the riches of her household. She was later seen in Syria where, legend has it, she fell in love with a river god. The same legend claims that she left her body to join the river, but others say she accidentally drowned. The spring after she disappeared, a eucalyptus sprouted near a stream. the rock dove, the waterfall. build air castles in the weeds. stare back at me in the afternoon. the wind rises. I stay. I soak up the river's bed. and I am always thirsty. I will never return to dry land. flatten hemispheres against their walls. Our eyes narrow, take the shape of fish. we see ourselves staring in windows. Ahead, a blue eye watches. to call it by name. on her thick black hair. will swarm with young Europeans.